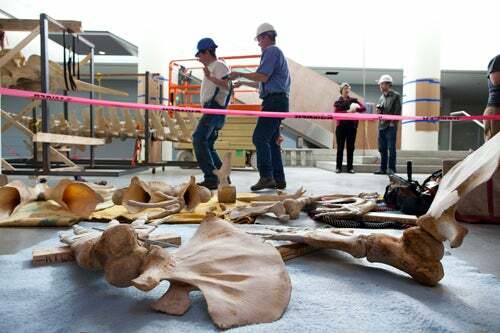 Two whale skeletons last displayed in the 1930s at the Harvard Museum of Comparative Zoology (MCZ) were given new prominence in January, after they were taken from the MCZ’s dusty attic, cleaned, and moved to the pristine lobby of the new Northwest Laboratory building next door. Though they ended up less than 100 yards away, the specimens, a 21-foot killer whale and a 24-foot northern bottlenose whale, made a long trip to get there. 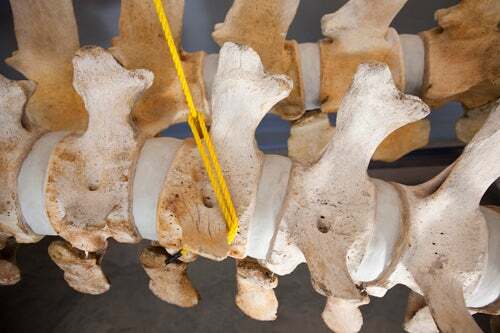 They were first shipped to the Maine offices of Whales and Nails, a specialty preparation firm that cleaned, repaired, and then installed the specimens. MCZ Director James Hanken, Alexander Agassiz Professor of Zoology, was enthused about the installation, saying it serves several purposes: opening part of the MCZ attic, restoring the two specimens, displaying them publicly, and enlivening the Northwest Building’s lobby. Over the next few months, signs and lighting will be installed to complete the display. 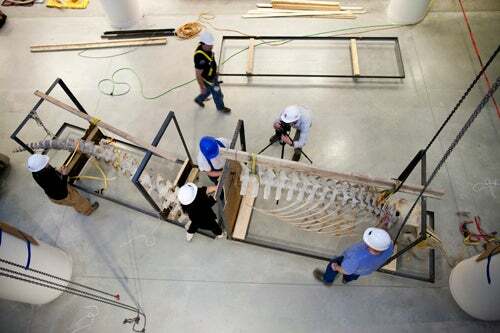 Hanken, who had a hand in planning the Northwest Lab because there is MCZ collections space in its lower levels, said he was an early proponent of the whale installation. The skeletons were removed from the MCZ in July and sent north, where they were slowly cleaned and prepped for display. 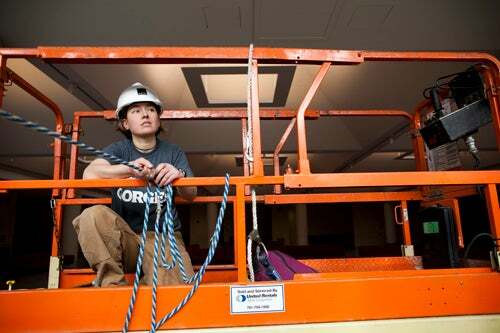 The installation, coordinated by Linda Ford, MCZ director of collections operations, was delayed by a snowstorm but ultimately went ahead in late January. 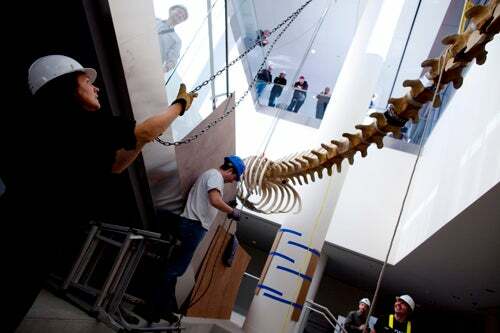 The specimens were hung in the lobby stairwell, the bottlenose whale arranged in a twisting dive down to the lower level, while the killer whale is posed in a jumping breach position, its toothy skull visible through the building’s windows. Though the diving and breaching positions are unusual ways to display such specimens, Hanken said they were chosen because they show the animals in more natural postures than their original straight positions. The killer whale — the largest member of the dolphin family — is the older of the specimens and was collected near the Faroe Islands in the North Atlantic in 1881. The bottlenose whale, a small, deep-diving whale related to the sperm whale and once prized for its oil, was collected in the 1930s, also near the Faroes. A killer whale and bottlenose whale, from Harvard's Museum of Comparative Zoology, are ready to be moved downstairs and installed in the front stairwell of the Northwest Lab Building. 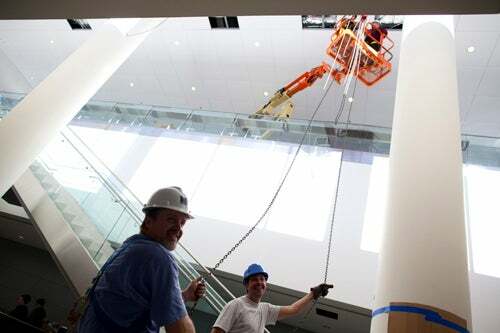 Frank DenDanto (clockwise from left), Courtney Vashro, Greg Howell, and John Hollister work together to transport a whale downstairs. Linda Ford and Dan DenDanto celebrate the successful transport. The team works to assemble the second skeleton. Courtney Vashro momentarily rests from her skeleton duty. Frank DenDanto (left) gets some help with his hoist from Toby Stephenson, as Linda Ford and Jon Woodward talk about plans in the background. Toby Stephenson and Frank DenDanto lift their cohorts. 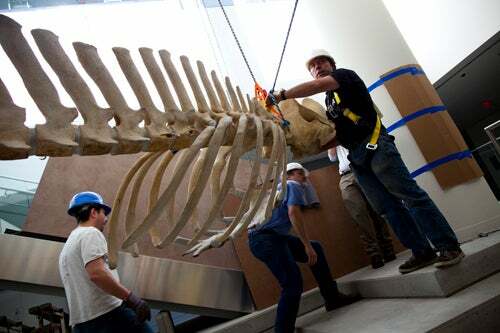 Frank DenDanto (from left), Dan DenDanto, and Courtney Vashro carry the whale to the front stairwell of the Northwest Lab Building. 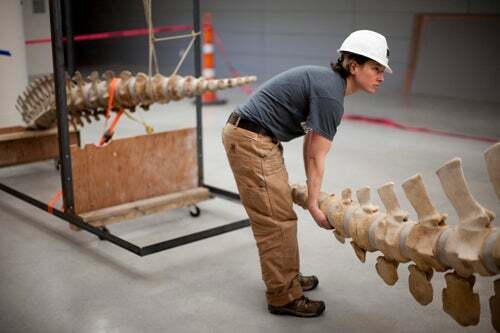 Courtney Vashro holds a whale tail as the team lifts one of the skeletons. Judy Chupasko (from left), Frank DenDanto, and Toby Stephenson lift a skeleton into place. 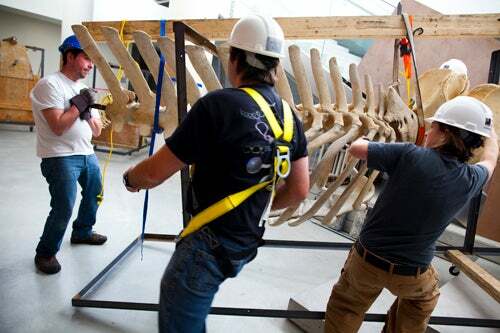 Frank DenDanto (from left), Toby Stephenson, and Dan DenDanto rely on muscle and one another to hoist the unthinkable — a whale skeleton. Judy Chupasko (from left), John Hollister, Frank DenDanto, Jon Woodward, and Dan DenDanto know that working together make lifting whales less of a mammoth task.